We have integrated IT systems of leading tyre manufacturers in the world. This allows the users of our B2B platform to order tyres in one place, without having to log in to a dozen of different systems. POP (Partner Opony Polska) is a Polish tyre service chain operating since 2002. Currently, the chain comprises nearly 100 repair shops throughout Poland. They provide services for tyres, mechanical repairs and replacement of consumables. Each one of them has its own B2B system that enables dealers to make purchases. However, these systems have a huge disadvantage from the dealership point of view. It is not surprising that each manufacturer offers only products of its own brand. Therefore, checking the availability of tyres of different brands and a specific size is not an easy task. Additionally, it is not possible to generally determine the price of selected tyres due to the extremely complicated system of calculating discounts and the so-called after-sales bonuses. Manufacturers usually provide the list price only that has nothing to do with the actual price on the invoice. Not to mention the calculation of the bonus (mainly settled on the half-year basis). This prompts the following idea - the dealer should log in to one platform only. This platform will connect to manufacturer systems and show the information in one place. How to efficiently and reliably retrieve the inventory information from a remote B2B system? The EDIWheel protocol, developed jointly by the most important players in the tyre industry, turned out to be the best solution. It enables to reliably communicate with SAP (or other ERP) systems of manufacturers. It should be noted, however, that trying to get technical support from manufacturers usually ends in failure. Fortunately, our team has coped well with all the problems encountered. Servers of manufacturers are in remote locations and they are always considerably loaded because of centralisation. How to guarantee an adequate performance? The solution turned out to be the intelligent and balanced use of the AJAX technology. All data are collected asynchronously from manufacturers and gradually presented. As a result, during the prolonged wait for a response from one of the servers (which happens quite often), the user can already see the availability in a competitor. 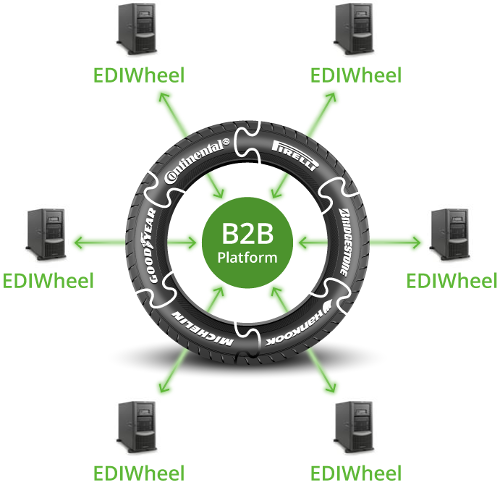 If we could successfully integrate B2B systems of tyre manufacturers and dealers are now using only one tool, we might be able to show them the offer of wheels on the same purchasing platform? Yes. The Alcar company, a manufacturing and trading group operating worldwide, which focuses its strategic objectives on wholesale trade and manufacturing of steel and alloy wheels, has developed its own EDI (Electronic Data Interchange) tool. Using this interface along with a comprehensive range of tyres in a single B2B platform, dealers in the POP network also see the full range of wheels. The B2B tool we have designed and developed enables the dealers to save a lot of time. Checking the inventory of manufacturers, ordering tyres and wheels, and tracking the status of orders now takes place in one location, without having to log in to a dozen of different systems. The project has been co-financed by the European Union under the "Innovative Economy" programme. Polish specialists are well known throughout the world from the ability to deal with adversities in a very creative and unconventional way. Can you believe that there had been basically nothing but empty shelves in our shops for over 40 years? Despite it, we dealt with everything by "doing it yourself". Probably this project was a success due to such an experience.